When the fourth segment is traced to the lush planet of Tara the Doctor opts for a spot of fishing leaving Romana to find it on her own. She locates it, disguised as part of a statue, but is attacked by a Taran wood beast. She is rescued by Count Grendel of Gracht who sees off the beast and takes the segment from her for registration. As she tries to leave she twists her ankle and Grendel insists on taking her to his castle for treatment. When they arrive, Grendel and Lamia, a surgeon-engineer, are all set to disassemble Romana but are astonished when her ankle is seen to be swollen. She is a creature of flesh and blood and not an android as they had thought. The Doctor, meanwhile, is captured by Swordsman Farrah and Swordmaster Zadek, two men loyal to Prince Reynart, rightful heir to the throne of Tara. They are interested in his knowledge of science and enquire if he can repair androids. They lead him off to meet Prince Reynart who explains that his coronation as King is due to take place the following day and that Grendel will do anything to stop the ceremony as if it does not go ahead as planned then Grendel will become King by default. An android of the Prince is intended as bait to safeguard Reynart, and the Doctor is forced at swordpoint to help repair it. Grendel kidnaps the Prince and the Doctor is forced to modify the android so that it may be crowned in place of the genuine article. The Doctor summons K-9 from the TARDIS and sends it off to Castle Gracht to check on Romana. Meanwhile he arranges to get the android Prince to the throne room in time for the coronation. Romana is placed in a cell with the injured Reynart. The Count is also holding the Princess Strella captive (she is the exact double of Romana - hence his and Lamia's astonishment that Romana was not an android) but she will not cooperate in any of his plans. Grendel now intends to marry the real Prince to Romana (persuading her to pose as Strella) and then kill him, following which he will marry Romana and then kill her, thus ensuring that he becomes ruler. Reynart's coronation goes ahead but Princess Strella arrives towards the conclusion. The Doctor realises that this is an android copy sent to destroy the android Prince, and disables it. The ceremony is put on hold until the following day and Grendel begins plotting another way of achieving his plan. 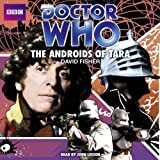 He constructs another android copy of Romana - this time equipped with a lethal ray operated by the Doctor's voice - and arranges for the Doctor to come and get her at the Pavilion of the Summer Winds. K-9 recognises the trap and saves the Doctor. Meanwhile the real Romana escapes from the castle and in her turn rescues the Doctor and K-9, who have been trapped by Grendel's men. Grendel turns the tables when he destroys the Reynart android with a spear and re-captures Romana. He arranges for his twin marriage ceremonies to be conducted by the Archimandrite while the Doctor, K-9 and the Prince's men prepare to attack his castle. The Doctor enters the castle via the moat and manages to disrupt the ceremony (having first found and pocketed the fourth segment in Lamia's workshop) and battle is joined as the Prince's men attack. In the confusion, Romana saves Strella from being killed and the Doctor fights with Grendel on the castle battlements. Grendel dives into the moat and swims to safety leaving the Doctor and Romana to work out a way of rescuing K-9 who is still on a raft on the moat.